Protein Bar in delectable choco delight flavor is the new go-to protein source with 22g of protein per serving. This Protein Bar contains 27 essential vitamins and minerals to add to your healthy snacking. This snack replacement bar gives you 9.5g Net Carbs per serving. This gluten-free protein bar is made using the international standards raw material. Sourced from the USA and provides 5.5g of fiber per serving. It also improves your body’s ability to absorb essential nutrients. The carbs used to make this delectable bar are sourced from all clean and 100% vegetarian sources. 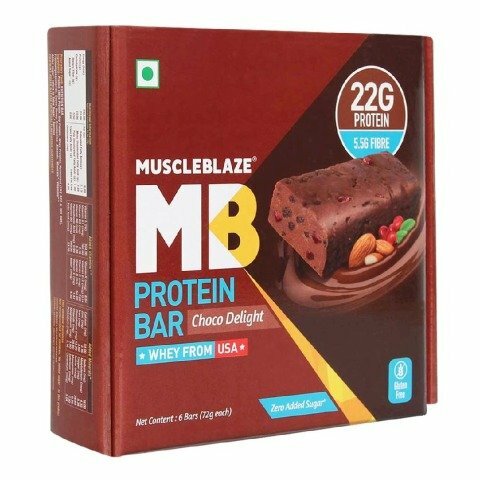 To Recieve updates and possible rewards for MuscleBlaze Protein Bar please sign in. To Recieve updates and possible rewards for Diet Supplement please sign in.